Alysia has become, officially, an ambassador for teacher-powered schools. She even gets to go to Washington next month, all expenses paid, to be on a panel at a conference. I was reading the webpage of the group sponsoring the conference. It contained a link that had a link to a blogger writing about teacher leaders. He opened with reference to remarks Arne Duncan, secretary of education, had made about how we need to change our current organizational model in which a master teacher, worthy of more influence and salary within public education, must leave the classroom and move up into the district hierarchy to gain that influence and salary. Secretary Duncan was saying we needed to develop ways that teachers could become leaders while remaining within the classroom. This brought to mind an experience I once had in the early days of Chrysalis. I was giving our annual report to our sponsoring district board shortly after the governor had declared that all eighth graders would take algebra. I said somewhat self-righteously, flaunting the independence of charter schools, that we did not believe that all eighth graders were ready for algebra and we would not be teaching algebra to all of our eighth graders. The superintendent cut me off, saying this was not appropriate for a board report; that he thought that all eighth graders could succeed at algebra and that the district, with proper instruction at the earlier grades, would achieve this goal. We continued not putting all of our eighth graders into algebra. A few years later we heard from the high schools of too many freshman ending up in remedial algebra classes and often failing it again and repeating it again because they had been pushed too fast in previous grades to get them ready for algebra and they had no secure foundation and the high schools couldn’t take the time to go all the way back to teach fractions. That district had many good teachers and some of their very best had been promoted into the district hierarchy as curriculum specialists to inservice the other teachers in the district. I know that many teachers benefited from their knowledge. But they also went along with implementing the governor’s declaration that all eighth graders would take algebra. Surely they must have known it was not right but they had to go along because that is how the chain of command works. You assist passing the command from the top down to the teachers. So when I read that Arne Duncan wanted a way to create ways for teachers to become leaders without having to leave the classroom, I have to ask the question: what do you mean by leader? Do you mean fitting into the hierarchy of command, helping pass down the “one model fits all” solutions originating from on high? Or do you mean leading the teachers to take more of the power of deciding what happens within their classrooms, to overrule top-down commands that cause harm, and be able to send corrective feedback back up a chain of command that is open and responsive to it? but massively late as days begin growing longer in 2015. The drought this summer was extreme. The ground was baked hard. Many lower branches died and easily snapped with a crack. Fear of fire rose any time the wind blew stronger. But the winter rains started early with three inches of sustained rains gentle enough to all soak into the parched soil. All the seeds sprouted. Something similar happened last year but then no rains fell for months and all the sprouted seeds withered. But this year, there has been rain every week or so; all the sprouting seeds are doing fine. Minds relax as wildfires become impossible for awhile. In addition, the temperatures have been warm. That is unusual. Part of the ecological constraints of California’s Central Valley is that our rains come during the winter cold, not during the sunny hot days of summer. Life thrives best in warm moistness. Warm moistness is limited to just a few months in California (unless irrigated). Therefore, decay of fallen wood is slow. But this year, we have already had 3 months of warm moistness with probably four more to go. Mushrooms are popping up throughout the oak woodlands. Dead twigs no longer snap; they just bend. The soil is soft and open. I love Frisbee and I try to pass the joy onto Chrysalis kids. One game I play with them is Moment of Glory. It is the last play of the Super Bowl and we are down four points. A touchdown would win it and here it is, a long pass, your chance for a Moment of Glory. A kid runs long and I throw the Frisbee way out in such a way that the child has to really run and stretch to catch it. If they do, my arms go up in the air as I bellow a loud Yes. However, most of the time, they don’t catch the Frisbee because these throws are not easy to catch. If they try hard but don’t quite catch it, I give an exultant groan of “Almost” and they come trotting back to try again. I’ve used the autonomy of a charter school to transform my eighth grade history class into the “What is Possible?” class. One strand is the process by which the medieval belief that the Earth was the unmoving center of a small universe transformed into our current understanding. I grew more aware this year of what a protracted, fascinating process that was. More than a century passed between Copernicus’s mathematical presentation of a heliocentric model and Newton’s precise description of a universe knitted with universal gravitation. So many disparate assumptions and experiences were so intertwined, creating such inertia, that the shift could only happen slowly, gradually. For example, Johann Kepler who first worked out how planets actually orbited the sun was a court astrologer. How much of the careful observations and complex mathematics that developed his new model were in service to refining astrological predictions of the movement of the planets, thought important because of assumptions that emerged from the former model: that we are the unmoving center of the Universe both physically and spiritually so that it made sense that the skies we see around us would somehow record and communicate God’s intentions and could be used to more precisely align our actions with His Will (astrology). My favorite example of inertia was one of the objections to the Copernican notion that the Earth revolved around the Sun. If the Earth orbited the Sun, then that should cause the apparent position of the stars to shift as we circle around – just as moving your head from side to side makes things near at hand appear to move back and forth in relation to their background. This is a completely accurate, scientific objection. The kicker is that the Earth at the Center created an assumption of such a small universe that “scientists” back then could not comprehend that the stars could be so far away that their “parallax” could not be measured with the instruments of their time. And so false assumptions of distance based on a false model led to a seemingly accurate refutation of a more accurate model. Things would have to wait decades until Galileo, with his telescope, observed that Venus went through phases (like our moon), a phenomenon that could only be explained if Venus orbited around the Sun. I continue passing Chrysalis’s administrative duties off to more competent hands. I was part-time teacher, part-time administrator. I love teaching. I did the administration because somebody had to do it. The part I enjoyed the most was taking responsibility for seeing how much of the purpose of a school could be fulfilled without the need for administration. How far can a school get with just teachers concentrating on teaching? Surprisingly far. But there are administrative needs and as the school grew larger, it was growing increasingly hard for me to keep all the balls in the air and teach at the same time. It became time for the school to evolve to a full-time administrator who could still respect the teacher-led aspect of Chrysalis. Irene is doing a wonderful job of that. But she also brings a lot of administrative skills which have been eye-opening for me. Because I was focused on teaching and getting the school along on minimal administration, I was blind to ways that more active administration could help the school. Irene continues to delight me as she keeps pulling administrative rabbits out of her sleeves. She will help Chrysalis grow stronger and hopefully more influential within public education. Though I sympathize with some of the feelings of the writer, the watershed metaphor graciously credited to me is not the watershed metaphor I intended. So I sent the following email to the writer. This is Paul Krapfel, author of Shifting, that you credited for the watershed metaphor in your recent article. Like you, I deeply believe in the power of metaphor and, like you, I believe the current direction of our culture towards increasing concentration of wealth and power is dangerous and must be redirected. However, I write you because you are interpreting my watershed metaphor very differently from the way it is intended. I would not want my name associated with the way you are interpreting it. I do not want all the rivulets in the watershed to flood the big city; such a thing would create great erosion throughout the watershed. On the other hand, I would love to explain what the metaphor means to me because I believe it offers a productive perspective on our current dynamics. The rain that can’t be absorbed runs off. As it runs off, it converges. With each convergence, its speed and kinetic energy increases. (It’s like raindrops on windows slowly sliding downward until they connect with other raindrops and then they quickly flow down to the bottom of the window.) As the runoff’s energy grows, it gains the power to erode and carry away soil. This can create a downward feedback spiral. Less soil nourishes less plants so that more of the rain pounds the soil directly, compressing it so that it absorbs less. Less humus feeds less tunneling worms. More of the rain runs off. Erosive power grows, cutting gullies which drain the watertable so that there is less soil moisture upon the slopes, reducing creative photosynthesis throughout the growing season. Water has the power to create soil; water has the power to wash it away. It can go either direction. What happens depends on how much of the rain can be absorbed on the slopes and how much runs off. The work/play that I do (which helped develop this whole metaphor) is going out into the rain and finding ways to lead the runoff onto slower paths so that it will have more time to be absorbed higher in the watershed. The watershed metaphor for me is that we, the people, that each one of us is one square inch of a large landscape and each of us has power coming through us into the world. What do we do with that power? How much do we absorb to nourish creative actions and how much do we let flow away to contribute to erosion downstream? A wise culture wants to hold its power (including its wealth) high in the watershed, spread out over the slopes where it can nourish and be recycled many times. Rather than rivulets flooding the city, I want to see the rain absorbed deep into the soil, held high on the slopes. In such a watershed, there are few floods and few droughts. Groundwater smoothly sustains river flows. The second powerful implication of the watershed metaphor (and this, I believe, is part of what drew it to you) is that the “power” flows from the headwaters down to the river. From the people, not from Wall Street. We live within so many top-down organized hierarchies that it is easy to think of oneself at the bottom. No, we are at the top of the drainage. Power comes through us to flow into the watershed. We have more power than we realize. Because power is diffused over millions of people, we don’t realize how much power resides within the slopes. Part of the power of the watershed metaphor is to help us all grow more mindful of this power and that each one of us has responsibilities for our contribution to it. The wise contribution is to help one another absorb ever more of our power so that more possibilities emerge within the diverse watershed. This is very different from water pouring down to flood the city. The West, including our area, is in severe drought. I’m a little terrified at how many of the lower branches in the blue oaks that surround our homestead are now dead, crackly branches, hanging down towards the dry grasses. I look around and see a vast surface area of low-hanging flammable material that would wick a grass fire up into the trees. Two years ago I bought a pole saw to start pruning these branches off. But once I had these branches on the ground, what do I do with them? A common practice is to burn them during the moist winter when fire danger does not exist. But that would put CO2 into the atmosphere and contribute to global warming. Wouldn’t it be better to have the wood decay into the ground and sequester carbon there instead? So I piled the branches into mounds to act as cover for birds and other animals. However, I know from previous experience that it will take 15-20 years for these brush piles to decompose into the ground. Our challenge in California’s Central Valley is that the summers are hot and dry; the winters are moist but cold. The organisms that decompose wood are most effective in warm, moist environments but warm/moist occurs for only a few months (late February into late April). Too cold before, too dry after that. This period is even shorter for woody material that is up in the air. It air-dries quickly so the decomposing organisms have limited time. Since time is limited, the main way I can increase the rate of decomposition is to increase the surface area in contact with that warm, moist ground. This has led me to a new activity. I walk around the perimeter of our homestead, breaking off the low-lying twigs and branches that easily snap. I let them lie where they fall. But as all these branches accumulate on the ground, I consciously try to step on them in a way that crunches and crumbles the branches and twigs into smaller pieces so that more and more of the dead surface areas scrunch into direct contact with the ground. My hope is that this will dramatically speed up decomposition, come the next winter. It should also dramatically decrease the rate at which a fire would burn through the area because an abundant 3D surface area of dead wood rising seven feet within the oxygenated atmosphere is being transformed into a vast but flat scrunch of surface areas pressed into many square feet of moisture-holding ground. So my hope is that I am both reducing fire danger and increasing carbon sequestration with the same, surface-area-moving activity. In the meantime, it is a fun game to look at the fallen branches around me and judge what step would lead to the maximum crunch underfoot. Each step exercises my sense of balance and flexibility. I was working on showing how certain characteristics of Chrysalis emerge from our mission statement of encouraging the light within each student to shine brighter. A kind environment is obvious. Less obvious is teaching for understanding (as differentiated from covering a certain amount of material in a certain amount of time)because we light up when we understand something. (The proverbial lightbulb!) We also spend time in nature because our minds/bodies evolved within the natural world and we experience a resonance in those settings that increases our light. But does “teacher-led school” necessarily follow from our mission statement? I was chewing that over for many days. What link, if any, exists between “encouraging the light” and teacher-led schools? What I came to realize is that one of the most important ways to encourage the light within students is to surround them with role models of adults whose light is shining. Our light shines brighter when we are creative, autonomous people, when we have the freedom to exult in and explore our passions. Teachers need to have freedom so they can model to their students what freedom in the adult world looks like. Top-down schools tend to restrict the freedom of their teachers — dictating what resources they can use, in what order they must teach things, herding them with test scores, imposing impersonal methods on teachers and students alike. This surrounds the young students with adult role models of drones – perhaps so the students will grow up not imagining more than a drone’s life—which might be the actual intent. I come to the Monday meeting with a plan to start outside balancing poles again, followed by a discussion of “who is in control” that is introduced with their merged written comments from their homework. Then I’ve decided to follow that up with something new, creating a Venn diagram comparing our hand with the pole – because, unlike the floor, the pole can respond and move. From there, I will talk about how our hands, eyes, and the pole are an example of a feedback loop, a sequence of cause and effect that loops upon itself. I will then sum up all of the pole balancing with a full, emotionally-engaged description of how this alive, dancing relationship we have with this pole is how we can relate to all of the world and each other. If time remains after that, I will introduce the history strand of the class. This is my plan. So over the Labor Day weekend, I decide to stretch The Point into a longer strand within the class. Their next writing assignment will be “what do you think The Point is?” I wonder how I could turn the individual kinesthetic experience of balancing the pole into a group kinesthetic activity and come up with a new activity. From baling cord, I made loops for each student. I will start with the students in pairs. They face each other. Instead of holding hands, they hold onto the loops. They then slowly lean backwards, balancing with the center of gravity between them. They can trust one another because they both will fall backwards if either lets go. Then combine pairs into circles of four, then eight, then finally the entire class of 16. I excitedly tell them about the activity I want to do with the loops. I ask how many have been on teeter-totters, how many have had the experience of being dropped hard by the other or having dropped the other, and what does that experience feel like. I tell them that to let go with these loops is a violation of trust and that there is no reason for it because if you feel yourself slipping somehow, there is time to give a warning. They do fine balancing in pairs. Then sets of 4. But 8 is hard. Some of the kids aren’t being mindful and the circles slowly veer off. I disappointedly stop the activity. As they are putting the loops back Students C and F are doing a pair loop and C lets F fall. I am shocked, heart-broken. How could she? C is apologizing to F and saying it was an accident but I have a hard time letting it go because it feels now like nobody will be able to trust one another. So I shift to history and for the rest of the week, we work on history. There is no reference to poles or the point. We do have great discussions about history, however. After a discussion about the Declaration of Independence (“governments are instituted among men”), Student G asks when did governments that have men controlling women come into existence and why. And as I give the Constitutional background to the structure of the House and Senate to prepare them for paying attention to the upcoming mid-term elections, Student D asks what do Democrats and Republicans believe. She’s heard the names but she really doesn’t know what they stand for. The kids’ writing assignments come in Sunday evening and it is clear that they are thinking only in terms of poles. So I decide, while walking, that I will do what I did last year in a similar situation. I, too, will write an essay and share it with them. I won’t stretch out The Point any longer and will instead give enough for them to build upon during the year. And so I write the following essay for them. The first part of The Point is, as several of you have said or written, about how, if we pay attention to the pole and move in response to it, we can “dance” with it in a way which would otherwise be impossible for the pole. I have you practice balancing the pole because it makes you practice “being mindful.” Mindful is more than thinking. Mindful is shaping our thoughts and actions in order to help the good, the right, the wise grow in the world. A second part is experiencing how you grow better with practice. The pole provides honest feedback on how you are doing which helps you learn how to balance better. Hopefully none of you got mad at the pole. It was just being itself. But as you learn, the pole grows into your ally, helping you create beauty where it did not exist before. But many of the parts of The Point lie deeper. A huge part has to do with how you can have the same dancing relationship with many parts of the world if you are mindful about it. This relationship is both active, yet also responsive. You control the pole – but only because you allow the pole to also control you. So it is with the world around you. You can dance with it. This class is responsive. You will help shape it. Each year the class explores a different path. Sometimes, magic happens. If you are open to wonder, wonderful things can happen in the same way a pole that lies on the ground can rise into an unpredictable dance. Sometimes things fall flat. It depends on what we all bring to it. A related part of this point is our relationship with one another. Practice seeing each other as a pole you are balancing. Feedback spirals intertwine us. One of the things I learn from the pole is to watch the top of the pole with a very active attending to every little change, realizing that every little change is communicating how the pole is moving. That is mindfulness. If I look only once a second, the pole will fall. If I look but don’t actively see, the pole will fall. An active fascination and openness to what’s happening with the pole brings into existence the mystery of balance. You can attend to one another with the same active care. Watch the expressions on one another’s faces. Listen to the tone of voices. We are broadcasting vast quantities of information about our current state. If I am mindful to others, I can tell what the person would like to become and respond to them in a way that helps. We can lift one another up and help each other maintain our balance. I can show in my responses that I am a friend who has no desire to hurt. If I do hurt, it was not my intention. Poles do fall in the process of learning to balance them. I will apologize and try to learn from it so it won’t happen again. This leads to a paradoxical image. Think of another member of our class as a pole that you are balancing on your hand. However, that person is also thinking of you as a pole balancing on their hand. We are both hand and pole. We are both responsive and creative. The more mindful we are in these relationships, the more exciting the possibilities that open up, both in this class and with our lives. We had a wonderful discussion after that as the class started considering the possibilities that could lie ahead of us. Then we balanced with loops again. This time they were more mindful of one another. They did good work with loops of four. I choose to not take it further that day; to end the exercise on a strong high point. We will see what grows from this. At my TedX talk last year, I said something like “a wise culture holds its rain as high on the slopes as possible” where it can be absorbed by plants and transpired to fall again as rain so that as much solar energy can be brought into the food web as possible. This led me to think about the difference between “having more wealth” and “having more wealth than.” The first is an absolute measure; the second is comparative. I’ve played the Hand Game with kids before where they have been so conditioned by winning that they can only think in comparison and not see the system as a whole. If we think of “wealth” as “a way of increasing possibilities for oneself,” then all living things seek more “wealth.” But holding the rain on the slopes so that it powers photosynthesis or transpiration to rise into the sky again as free oxygen, or vapor to fall as rain again, is a way of increasing possibilities for the entire system. One could increase one’s comparative water wealth by paving the slopes so that more of the rain ran off into a concentrated reservoir downstream. One could then have more wealth than otherwise, more wealth than others, but at the expense of the greater system. From a systems point of view, if one uses one’s wealth to increase the possibilities around one, this creates a rising of possibilities that spreads outward, spilling over borders. Your neighbors benefit from your existence and become your allies. Your work becomes easier. (I like to think that the archetypal example of this is a teacher, especially of children: enhancing and developing the gifts and talents each child brings forth into our culture.) However, if you harvest your surroundings to benefit only yourself, then you slowly make enemies. Your work becomes harder. A wise culture is guided by increasing wealth within the greater ecosystem – not on harvesting at the expense of other regions. Recently, I’ve been part of interviewing several job candidates. At Chrysalis, applicants come in and talk with three or four of us. We have a wide-ranging conversation for half an hour. And then I participated in a job interview with applicants for a position with our sponsoring agency. This job interview was designed by the Human Resources department of the agency, in compliance, I’m sure, with all sorts of policies and guidelines. There were six written questions. We took turns reading the next question to the applicant. We could repeat the question but if the applicant asked a clarifying question, we couldn’t answer it. We could take notes on the candidate’s answer; all notes were collected afterwards and included as documentation in the hiring process. Follow up questions were not allowed. Afterwards, we rated the applicant’s answers to each question on a scale of 1 to 5 and added the numbers. I now understood why one candidate Chrysalis had interviewed thanked us for a lovely conversation. She said at other interviews, there was no give or take, just a list of questions. I understand now what she was referring to. And then I learned from a dear one how individuals who were passionate about dance and fitness and had started their own studios were slowly being put out of business by corporations that were starting fitness centers across the country, that hired part-time instructors at low salary. So often politicians talk about businesses as job creators but there are different kinds of businesses, e. g., sole proprietors and corporations. Sole proprietors take on risk, follow their passions, create something unique, probably do job interviews as a conversation. A wise culture nourishes individual initiative. Tax breaks for corporations undermine sole proprietors. Corporate tax breaks are portrayed as pro-business but it is only one category of business, driven by global concentrations of capital, as opposed to dispersed local ecosystems of capital. A wise culture holds the rain high on the slopes. I wrote a chapter for Roaming that is more textbook-y than most of my writings. Therefore, I called it a footnote. I would appreciate feedback from readers as to how it flows, whether it makes sense, and whether it seems important. Your comments will hopefully help me hone that chapter. Alysia and I had solar panels installed on our roof this year. With tax credits, it appeared to be a far better investment than something like Wall Street and for a worthier cause. For the last few weeks, the panels have been producing 30-35 KW per day which is well above our average usage. From a systems point of view, if one uses one’s wealth to increase the possibilities around one, this creates a rising of possibilities that spreads outward, spilling over borders. Your neighbors benefit from your existence and become your allies. Your work becomes easier. (I like to think that the archetypal example of this is a teacher, especially of children: enhancing and developing the gifts and talents each child carries forth into our culture.) However, if you harvest your surroundings to benefit only yourself, then you slowly make enemies. Your work becomes harder. A wise culture is guided by increasing wealth within the greater ecosystem – not on harvesting at the expense of other regions. I’ve been too busy with multiple Chrysalis transitions to be able to write all I intended for this one. So, instead, a fairly straight-forward Chrysalis story, except for another strand I get to interweave at the end. This eighth grade class is one of the two most wonderful eighth grade classes I’ve had during Chrysalis’s 18 years. The relationships between students, with their teachers, and with one another plus their enthusiasm for learning allows possibilities to emerge beyond my imagining. The Chrysalis charter requires that eighth-graders, in order to graduate, must pass a test on the Constitution. Years ago, I developed a somewhat conventional class activity where I divided the class into the House and the Senate and they try passing a bill. The main purpose was for them to experience the process by which two groups, each with separate backgrounds and perspectives, had to come together in drafting the exact same language for a bill. The more specific and personal the bill, the more they learned, so over the years, the exercise shifted to writing a bill that involved Chrysalis. These often led me to write long, thoughtful explanations of why I, as president, was vetoing their bill and sending it back to them for further consideration. Usually a class would respond by taking my objections into consideration and crafting a more carefully written bill. Kids learned that it wasn’t easy to transform an idea that seemed appealing on the surface into specific language that acknowledged the actual complexity of the details. Last year’s eighth grade class (a very good class) asked whether this activity could actually create a “law” that would somehow change the way Chrysalis operated. I replied that if it was something that was upheld by the teachers’ co-op, then I would try to make it happen. They dove into the exercise and out of it, they drafted a proposal for an “open campus” where the eighth graders would be able to go to the neighboring supermarket at lunch time and buy lunch. After an initial veto, they redrafted the bill so that those eighth graders who had parent permission and who had demonstrated responsible behavior in the last several weeks could go over in groups of three or more one day each week. The teachers’ co-op supported the idea and so their “law” went into effect and it worked out great. Their law was such a great idea that I was afraid that it would pre-empt the exercise; each class thereafter would create the same law and not have to go through the actual work of wrestling with different agendas. Therefore, when I introduced this activity to this year’s class, I prohibited an open-campus bill. Their law would have to be about something different. I had to miss the first full class they had to work on the assignment but my substitute left a note that they were stuck. When I checked in with them the following class, they said they wanted to create a student council but that they were stuck on how officers should be elected. I shared with them frankly that several times students have wanted to have student councils and when we tried them, the elections were mostly a popularity contest, after which nothing much happened. But my students replied that they wanted to the councils to do things. “Like what?” I asked. Like wash the outside lunch tables. I said you don’t need a council in order to wash the tables. Let’s just go clean them and they did so with gusto and a sense of accomplishment afterwards. My interest shifted from the bill-writing simulation to something else. Kids are brought up within organization based on large groups with leaders. Does this teach them that before any larger-than-individual action is undertaken, leaders must be chosen? I wanted to experiment with having the kids self-organize without a formal structure. So we started using talking circles to discuss other projects they might want to do. One thing they wanted to do was raise money and go on an 8th grade trip. And I had to tell them, as I’ve told other classes, that Chrysalis doesn’t do an 8th grade trip. I explained that attempts in the past had always run into problems – usually involving parents. In fact, the previous year, some parents had wanted to create a fancy trip for the kids after graduation. They had made a big fundraising push but not all the kids had wanted to participate in their fundraising so some parents wanted the funds to go to only certain kids and the whole thing fractionated and fell apart. That was one of the reasons the school does not do a class trip. But then one of the students arranged with her relatives, who lived about an hour from the city, to stay the night in their church. Suddenly the price for the trip dropped. I wrote to all the families describing what the kids wanted to try doing and explaining the condition that all students would be able to go, and asking each family if it needed a scholarship to participate. There was a need for a couple of hundred dollars. A parent from last year’s class reported that the couple of hundred dollars they had raised for a class shindig before things fell apart was sitting in the school’s auxiliary fund and perhaps the class could tap into that. So we tapped it as a scholarship fund. Now we were guaranteed that every one could go. Then another student had grandparents who lived in the same town as the church who offered to host us for dinner and breakfast. The students tried a bake sale. They came running back at the end of it with eyes so wide and excited because they had raised $125 and they could’ve raised more if they had more food. Now there was a strong sense that this trip was going to happen, that they were going to make it a reality. The trip was planned for the Monday and Tuesday following school graduation. And then two weeks ago, three of the students found out that they had been accepted into a high school program that required them to start practicing that Monday after graduation. Another student learned that she had dress rehearsals for a dance performance the entire week after graduation. And suddenly, the whole trip ran into a wall. Could we switch to something local? It wouldn’t be ethical to use money donated to travel to the academy to have a fun time locally. If not everyone could go for logistical reasons, what was the ethical way to choose a date upon which some but not all could go? The kids learned the word, ethical. For a week we were all frustrated and stymied. And then on Friday one of the girls involved in the whole scheduling problem came running up excitedly saying that she would have permission to miss her dance rehearsals the next Thursday and Friday and could we go now, during the school year? The other teachers were all right with the eighth graders missing classes on Friday. Three parents offered to drive. We organized a last-minute bake sale for that Wednesday. The kids brought an amazing amount of baked goods Wednesday morning. We spent the morning on Wednesday talking about how to lay out the bake sale so that they could generate the “most dollars per minute” (a new concept for them). This time, supply exceeded demand. They still had many plates of unsold cookies. But they had also made another $175. Including donations, they raised $500. 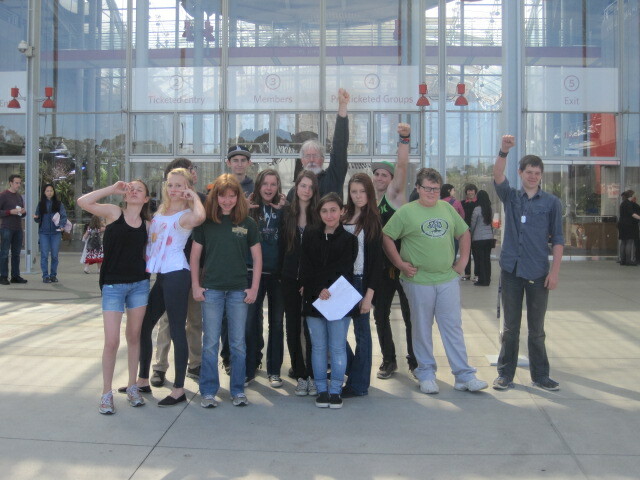 There was an absolutely wonderful sense of accomplishment and pride and ethical satisfaction that we were going to pull this off, that the entire eighth grade class was going to go down to San Francisco and see the California Academy of sciences. So after school on Thursday, May 8th, we drove down to the town where we had dinner and then stayed at the church. The kids, all excited, played hide and seek out in the dark until about 9 o’clock. And then I felt the need for reflection so we had a talking circle. One question I asked was how did organizing this trip make it different from a trip that was given to them by the adults. The students talked about how they had almost given up and yet we still pulled it out off. Near the end I asked the three parent drivers to share some of the thoughts they had while listening to their children talk about this. That led to talk about how this wonderful class had just one month left. They talked about how they had become close to one another and how they really did love one another and how good it all felt. The talking circle came to a nice warm close. Then one of the students asked me what I thought of all of this. Certain questions, asked in certain ways, create an opportunity for an answer to go deep, so mindfulness is wanted in order to choose and arrange words precisely. I found myself talking about love and how love was being aware of the light in one another and knowing it was beautiful and wanting to help it grow and knowing that the other person also was wanting the same thing for you and that together, love helped us explore what is truly possible with these miracles of lives that we are given. The next morning, we did it. We had breakfast at the grandparents’ home and drove to San Francisco. We went to the California Academy of Sciences. We saw the planetarium show. We watched penguins get fed. We had lunch. We went to the tropical rain forest exhibit. We gazed at the aquariums. Afterwards we played by the ocean and gathered sand dollars. We walked to a nearby deli where the kids had a great urban experience talking with the store people who served them delightfully. And then we drove home late that night. Now I get to interweave the other strand into this story. Whitehead argued that curriculum should be developed specifically for its own students by its own staff, (italics added) or else risk total stagnation, interrupted only by occasional movements from one group of inert ideas to another. “Curriculum should be developed specifically for its own students by its own staff”; that is what this story is about. Last week, I asked the kids to describe some of the things they learned from our deviation from my lesson on government. Here are some of the value-laden lessons (not found in standardized curricula) that can emerge from schooling that is responsive to its students. Working as a semi-functioning team: We all had to put our differences aside to create a plan that would be doable. Listening skills: We had to realize when we were screaming over one another and handle it. We handled it by getting a talking eraser. I think since we were the first class that hasn’t done the bill with the house and senate exactly how you wanted us too, we are pretty dang awesome. I also think from a person who watched her classmates scream over each other with excitement that when people are given the opportunity to speak, that thirteen and fourteen year olds are capable of being some type of organized. Most people see us as either babies or demons. By creating the trip, I think we showed people that we are mature enough to handle situations that would be easier with the help of an adult. Think for yourself. Each kid needed to help in their own way to complete the job. Don’t create a bottleneck. If we didn’t split the lines at the bake sale, it would have been very hard to get everyone fed. Because we had two lines the second time, it went a lot better. Work as hard as you can. If you do your best, it will be better than if you didn’t. Try to be ready for anything. If you do this, it won’t seem that bad. Be grateful for what your parents do for you because what they do isn’t easy. Sometimes things don’t always go as you planned but that doesn’t mean you should give up because if you give up then you definitely won’t be able to accomplish your goal. You can accomplish whatever you set your mind to even if it may seem too hard or too big; just keep trying. This trip brought all of us closer than I ever thought was possible. Even though we had disagreements along the way this trip brought us A LOT closer. Perseverance – Even when it became difficult, we kept on going. Responsibility – We needed to learn to be responsible and fulfill our commitments such as bringing goods for the bake sale. Time management – We had a short amount of time to get what we needed to get, yet we still managed! Teamwork – Everyone pitched in and helped! We all did work, not just one or two people. Money management – We learned how to properly earn money – “run a business”. Confidence – I think that we all gained confidence from this experience. We didn’t think we could do it but we DID! That is huge! Self-organization – We did have the help of many people, but I think we truly learned how to self-organize. If you work hard enough, you will eventually reach your goal. What can seem impossible can seem possible if you work hard enough. Keep trying, even if you’ve lost faith in yourself. I learned to never give up. I know we already talked about it during the talking circle but I feel like that was one of the biggest things I learned. To never, ever, no matter what, ever give up. I feel like I learned a lot about friendship on the trip. I learned that friendships can come out of simply being in the same class, or sitting next to them on a 3 hour car trip. I learned that if you’re playing hide and seek and you hide with another person, when that person is found, the chances of the person who is “it” looking in that area more drops to 5%. I learned that you can be legally an adult with adult responsibilities, but you don’t, under any circumstances, have to grow up. Not one bit, not ever. Society may try to make you, but you don’t have to. Not giving up. We were so close to giving up but Violette and a few other people still had hope that we could make it and when we stepped foot in San Francisco, we all achieved our goal of making it. I learned many things from this trip. I learned that the saying “good things come to those who wait” can actually work sometimes and that if you work hard, your goals will get met. In the time we used to figure out the trip and try to do “student council”, we only planned an amazing trip but it was more of an achievement than I could ask for! I learned that independence is difficult, wonderful and a very big responsibility. I like being independent so when we are able to just do things how we want to do them, I learned sometimes they almost get done better than if we had help from an adult. When we decided on the trip, it was all our choice, not a given by the teachers. Then we had to work for it and we did it by arranging bake sales and creating donation boxes. Although lots of money we made came from help, even without all of the extra money we got, we still made enough money to go. Then there was the not giving up thing. Yes, it is good to not give up. If you give up, you stop climbing and start falling. If you give up, you come close to falling. Some people came very close to giving up but the trip meant more than to just forget about it. I learned how dependent people can be and how there are two groups, independent and dependent. In other words, leaders and followers. There were those of us who took charge and made things happen; then there were others who agreed with what we said and just went along with it. I learned how hard it is when you have a feeling that if you don’t step in and say something, then the structure will collapse. Violette’s last paragraph leads me back to the questions that originated this trip. As children, do we learn a dependence on leaders because the governance structures modeled to us depend on leaders and “selection of leaders” is modeled as a necessary step before the governance can accomplish anything? Have we abdicated some of our power to a learned sense of “leaders?” What Violette is expressing is that leaders don’t have to be chosen. Leaders emerge from the people who care enough about something to start doing the work. Doing the work precedes the emergence of leaders, not the other way around.